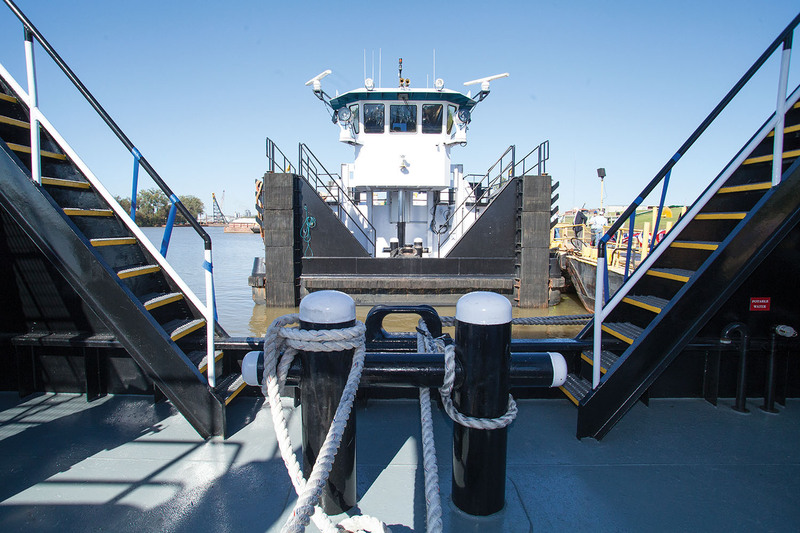 Vicksburg, Miss.-based Magnolia Marine Transport, the marine transportation subsidiary of Ergon Inc., celebrated the christening of two towboats November 6 at the company’s headquarters on the Yazoo River. The newly-christened towboats, the mv. Miss Ellie and the mv. Miss Marley, were both built at Nichols Boat Company of Greenville, Miss., where all of Magnolia’s most recent vessels have been built. The 3,000 hp. 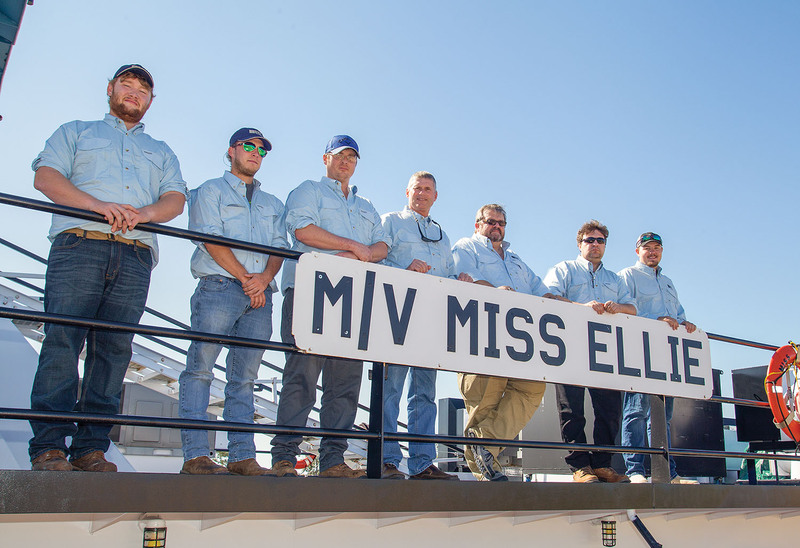 Miss Ellie was delivered by Nichols Boat Company in 2016. The mv. Miss Ellie, which came online in 2016, measures 110 by 32 feet with a depth of 10 feet 3 inches and a working draft of 8.5 feet. The Miss Ellie features a retractable wheelhouse that offers an air draft of 17 feet 5 inches when lowered and a maximum pilot’s eye level of 31 feet. Tankage aboard the Miss Ellie includes 46,000 gallons of fuel, 9,800 gallons of water and 1,400 gallons of lube oil. The vessel has accommodations for nine crew members. In the engineroom, the mv. Miss Ellie has two Caterpillar 3512C Tier III engines that produce a combined 3,000 hp. at 1,600 rpm. The main engines, paired with Haley HRV2411 reduction gears with a ratio of 6.143:1, turn 84- by 70-inch, four bladed Sound propellers. The vessel also is outfitted with a pair of John Deere 99 kw. generators. On deck, the Miss Ellie features two Wintech 50-ton deck winches. The mv. Miss Ellie carries an ABS limited load line certification. The Miss Marley, delivered just before the November 6 christening ceremony, is slightly larger and more powerful than the Miss Ellie. The Miss Marley measures 120.5 by 35 by 11 feet with a draft of 8 feet 11 inches. Also a retractable, the Miss Marley offers a 17-foot air draft with the wheelhouse lowered and a maximum eye level of 31 feet 4 inches. The Miss Marley has tankage for 61,536 gallons of fuel, 14,323 gallons of potable water and 1,172.5 gallons of lube oil. The Miss Marley has accommodations for up to 12 crew members. 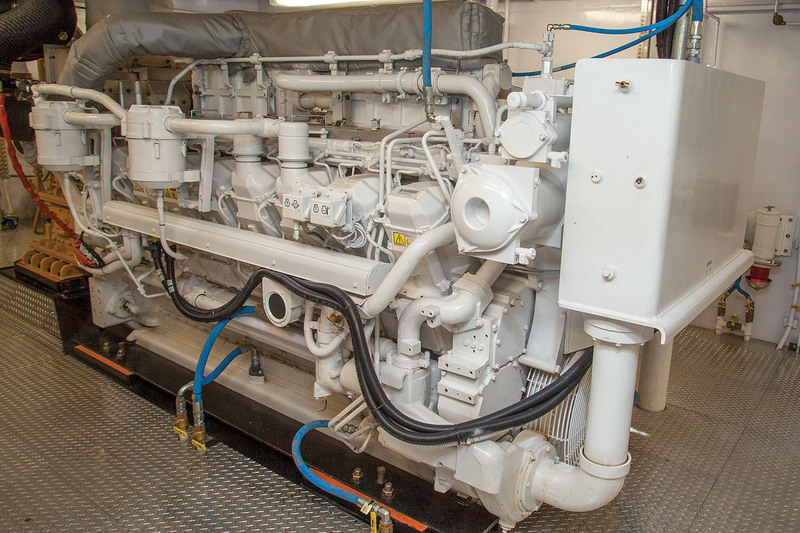 The Miss Marley is equipped with two Caterpillar 3516C Tier III main engines that produce 4,200 hp. at 1,600 rpm. The main engines turn 100-inch by 86-inch Sound propellers through Reintjes reduction gears, with a ratio of 7.454:1. The Miss Marley features two John Deere 125 kw. generators. On deck, the vessel is equipped with two Nabrico 65-ton deck winches. 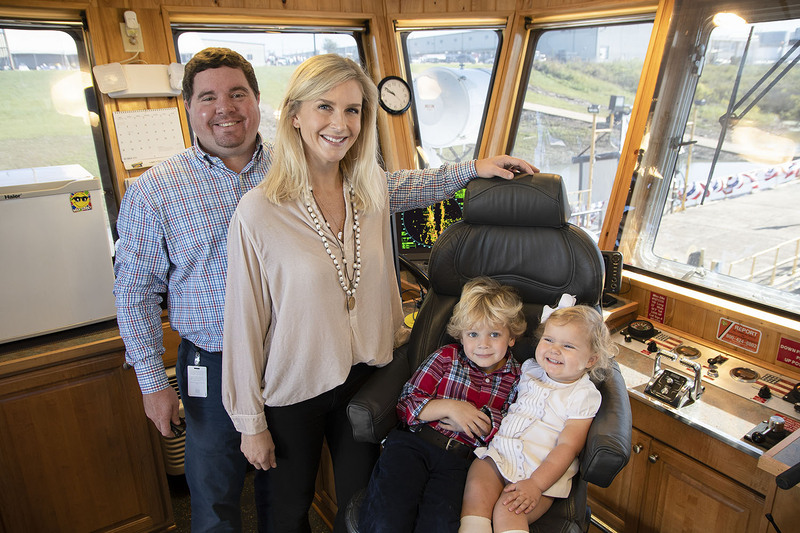 The Miss Ellie and Miss Marley continue a longstanding tradition at Magnolia Marine of naming towboats after female children born to Ergon founder Leslie B. Lampton’s descendants. The namesake of the mv. Miss Ellie is Elizabeth Katherine “Ellie” Lampton, daughter of William Azlin Lampton and Janna Lang Lampton. Ellie is named for both her maternal grandmother (Elizabeth Chandler Lang) and paternal grandmother (the late Katherine Azlin Lampton). The mv. 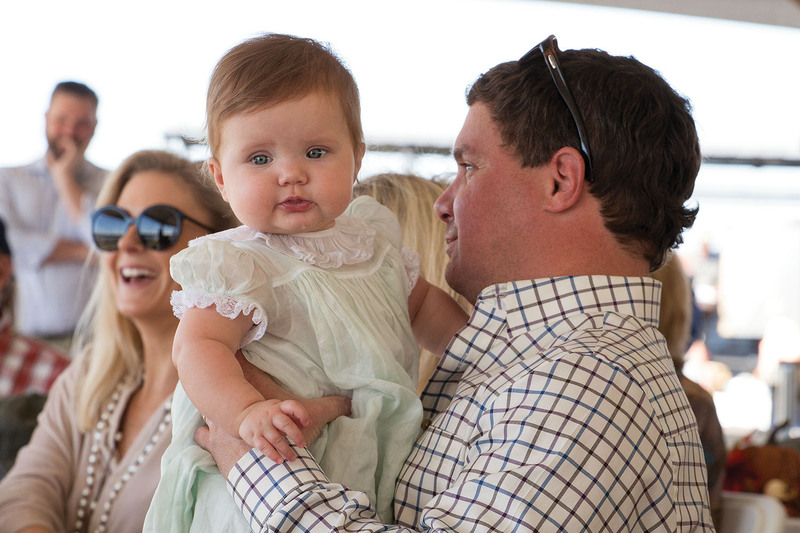 Miss Marley is named for Marley Oakes Lampton, daughter of Walt Lampton and Pfeifer Lampton. 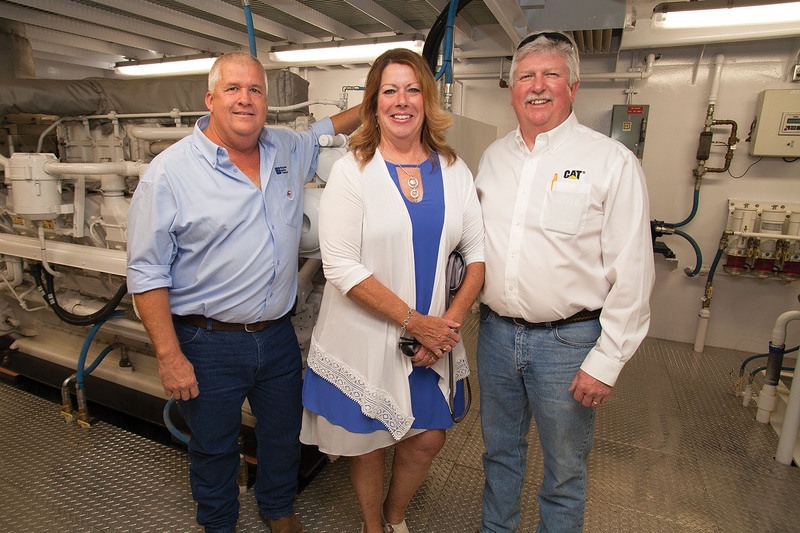 Will and Walt Lampton, twin brothers who both work for Ergon, are the sons of Bill Lampton, one of the four sons of the late Leslie B. Lampton and Dorothy Lee Crum Lampton. 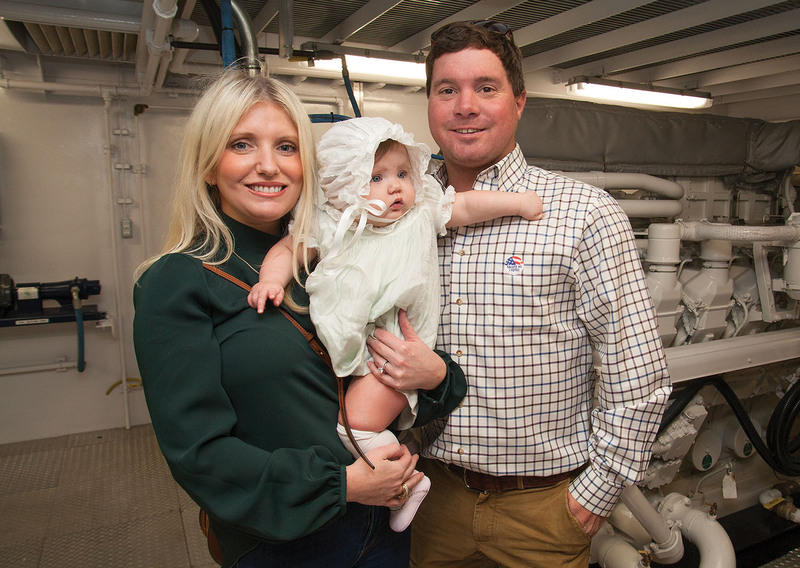 Both Ellie, a toddler, and Marley, an infant, were present for the christenings of the vessels that bear their names. 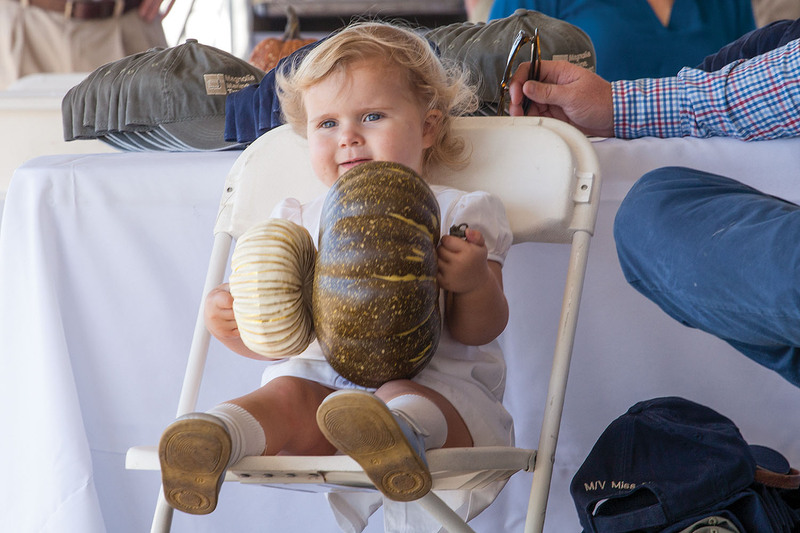 “We have many family members, and we’re so happy you’re all here, but we’re especially happy to have here the two guests of honor, one sucking her thumb and the other playing with the pumpkins,” Magnolia Marine President Stan Humphreys said. 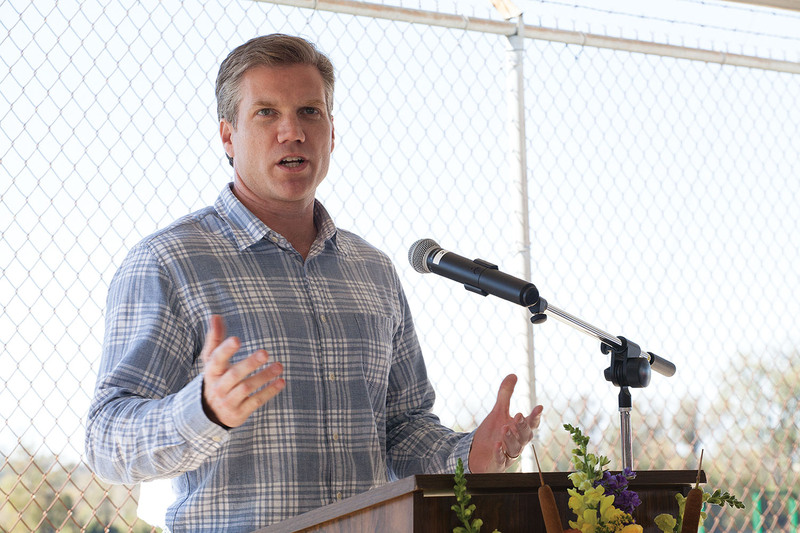 Humphreys said that the entire Ergon family of businesses is strong and continuing to grow. Equally important, he said, is that the Lampton family continues to thrive as well. 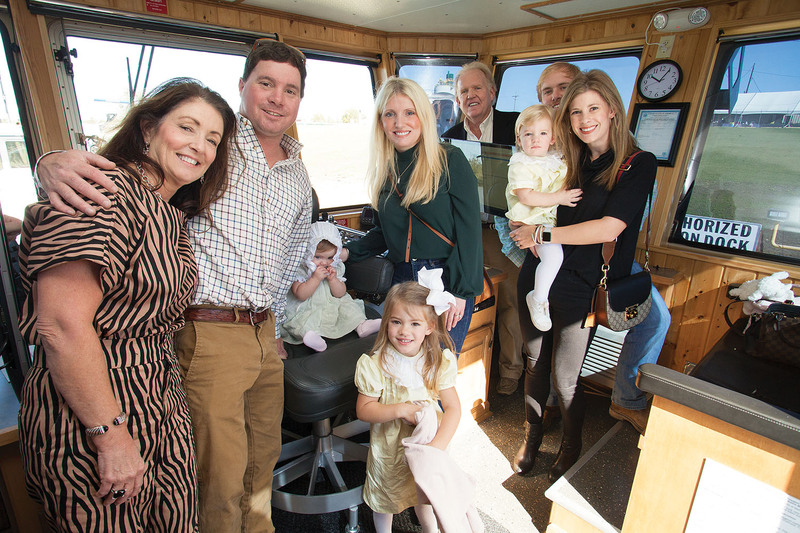 “Even more beautiful than these two boats and more important than the business side of our family continuing to grow is the fact that the fourth generation of our founding family is blessed with continued growth, as evidenced by these two beautiful young ladies, Ellie and Marley,” Humphreys said. “What a joy it is to have these two young ladies with us today. “I know that Mr. and Mrs. Lampton Sr., your great grandparents, are looking down from heaven today smiling and pleased that both the work they started many years ago and the family they began continues to be strong and to grow,” he added. Humphreys said the mv. Miss Ellie and the mv. 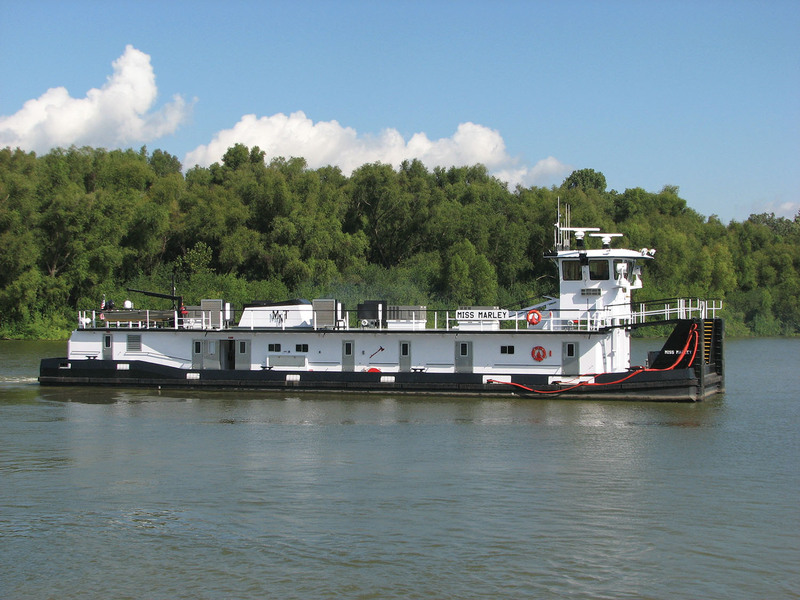 Miss Marley are the 23rd and 24th vessels in Magnolia Marine’s fleet, which also includes 85 barges. 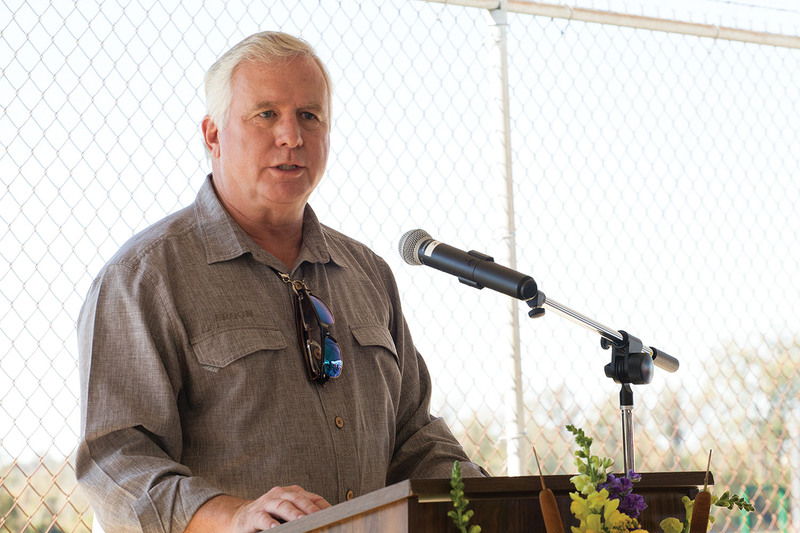 Quality equipment and faithful customers are key to Magnolia’s continued success, Humphreys said. But he also named a third key factor to the business’s success. 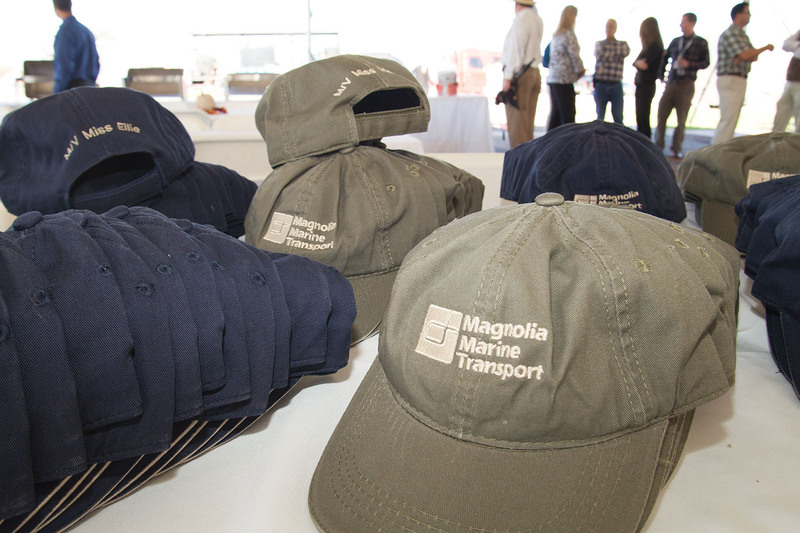 Bill Lampton, who along with his brothers serves on the board of directors for Ergon Inc., tied the naming of Magnolia vessels after female family members to the role his mother played in their family and the company. The Lampton family lost both Leslie B. Lampton Sr. and Dorothy Lee Crum Lampton about seven months ago. Leslie B. Lampton Sr. died April 17, and Dorothy Lampton died less than two weeks later on April 29. They were married almost 70 years. 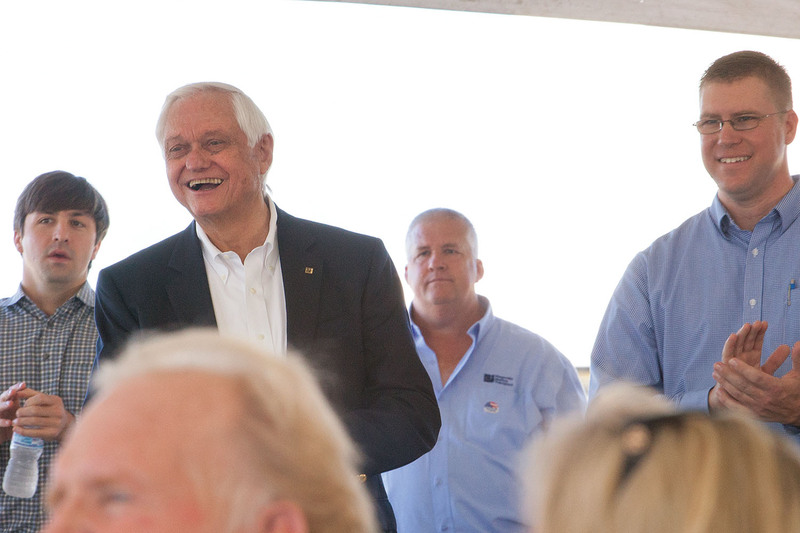 But despite the loss of its founder, the Ergon family of companies is in good hands with president and CEO Emmitte Haddox, Bill Lampton said. Bill Lampton added that, despite the impressive growth of Ergon, which boasts some 2,500 employees around the world, the company continues to call Mississippi home. “Always know, we’re committed to Vicksburg, we’re committed to Mississippi,” Bill Lampton said. The Rev. 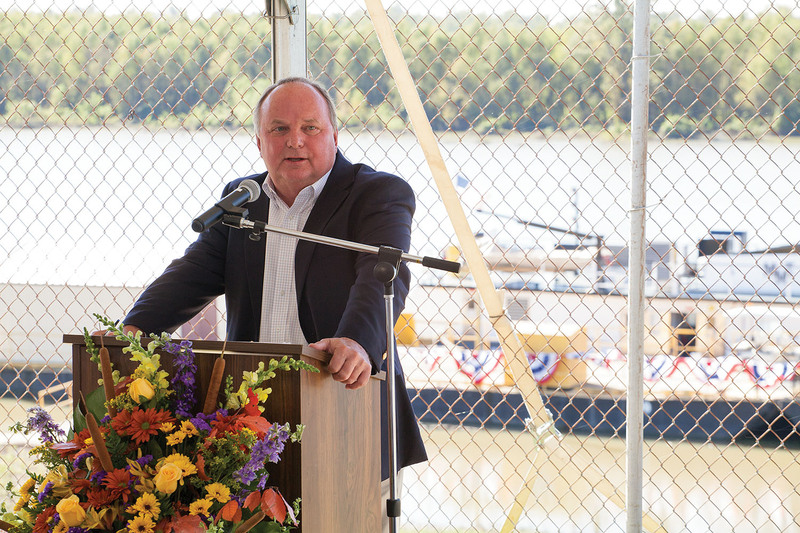 John Hugh Tate, pastor of Bellwether Church in Jackson, Miss., offered a prayer of blessing on the two vessels and the crews. He presented Bibles to the vessel captains, along with bottles of oil that were added to the engines on the mv. Miss Ellie and mv. Miss Marley, Magnolia’s traditional method of christening vessels. Caption for top photo: The 4,200 hp. Miss Marley was delivered just before the November 6 christening. 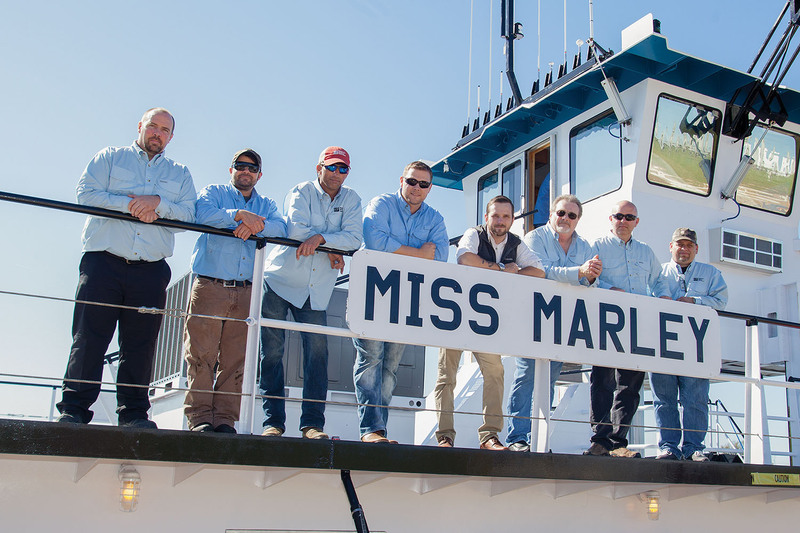 Crew of the Miss Marley, from left: Tim Billiot, pilot; Alex Kern, tankerman trainee; Charles Height, deckhand; Hunter Tubbs, mate/steersman; Capt. Charles Thornton; Capt. John Sullivan; John Gathings, mate; and Michael Tuckwiller, relief chief engineer.